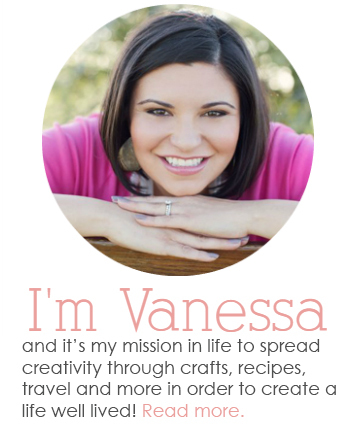 My family attended #DisneySMMC, an invite only conference hosted by Disney. 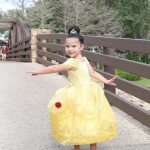 Our opinions, photos and love for Mickey Mouse are 100% ours! 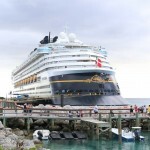 My family just returned from #DisneySMMC, an invitation only conference hosted by Disney, where we ate ALL THE THINGS. In fact, we made a list of snacks that we wanted to make sure to eat while we were there and checked them off our list as we ate. We are serious snackers when it comes to Disney food! It’s really the only time that I’m completely lax about diets and we splurge. If there was ever a place to splurge, it’s at Disney! 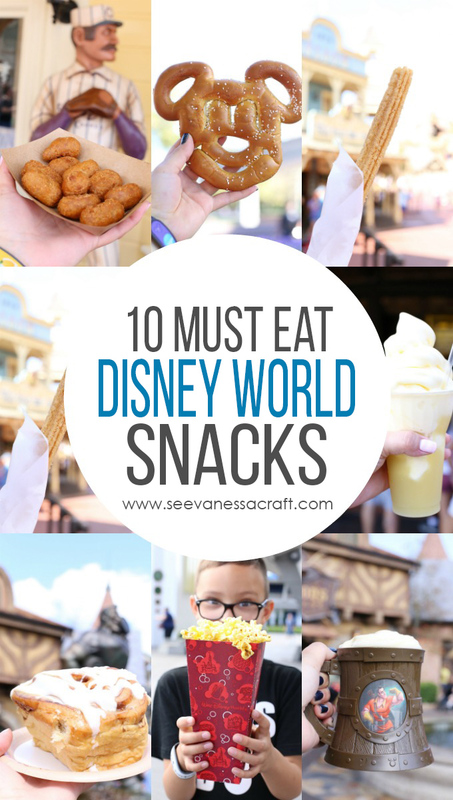 I rounded up our must eat snacks at Magic Kingdom for you. I’ll eventually compile lists for the other parks (Epcot will probably require a few posts), but for now enjoy eating your way through Magic Kingdom. 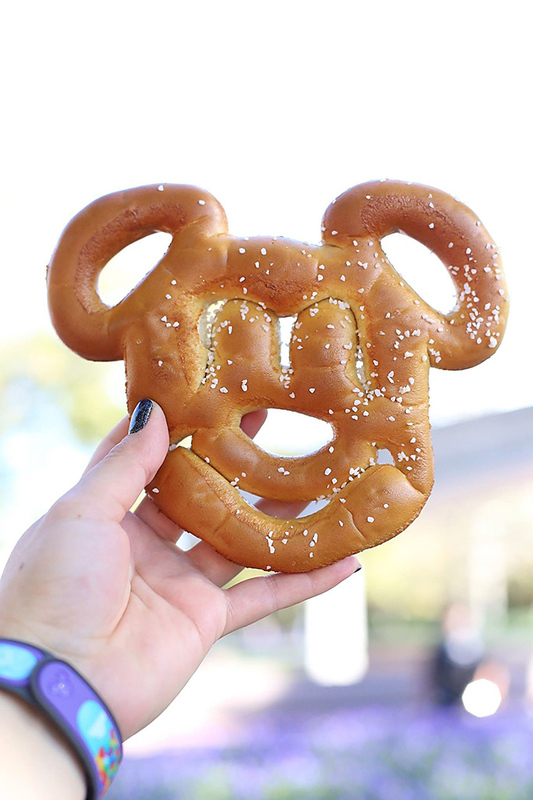 You might also enjoy our must try snack list for Disneyland. 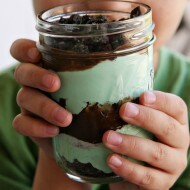 This is probably our most favorite Disney snack of all time. Our kids practically live off of these delicious things while we are in Disney. 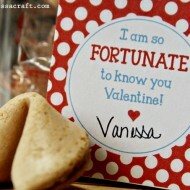 You can find them in various snack carts around Magic Kingdom. You can find a Dole Whip Float at Aloha Isle in Adventureland. 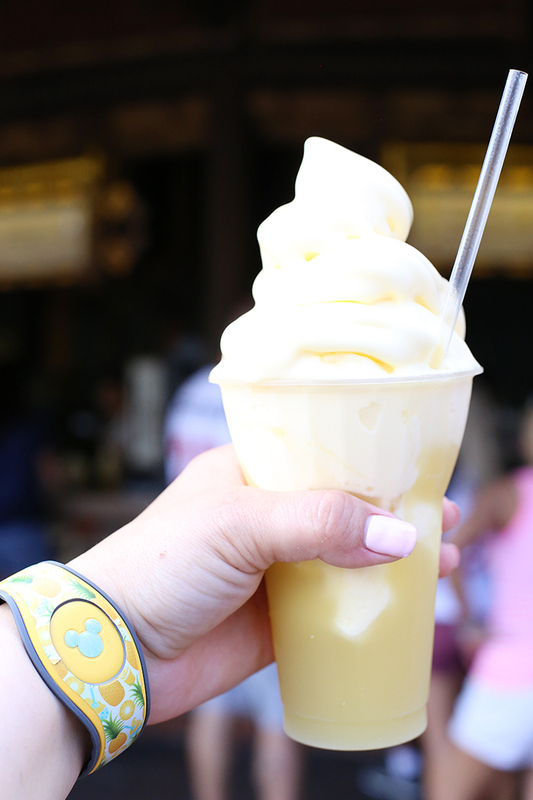 Grab your Dole Whips and head to the Enchanted Tiki Room to eat them while you enjoy the show. This has become one of our favorite Disney traditions. You can find a Dole Whip inspired Magic Band decal at My Fantasy Bands. Head to Sleepy Hallow in Liberty Square for this deliciousness! 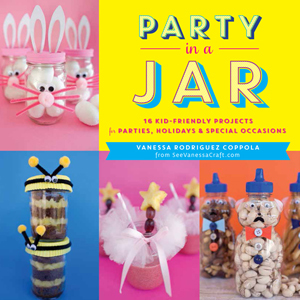 It has all of my favorite things – fruit, waffles and Nutella. You seriously can’t go wrong! 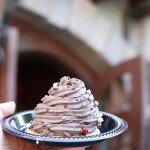 Sleepy Hallow also offers whipped cream topped Mickey Waffles and Funnel Cakes. 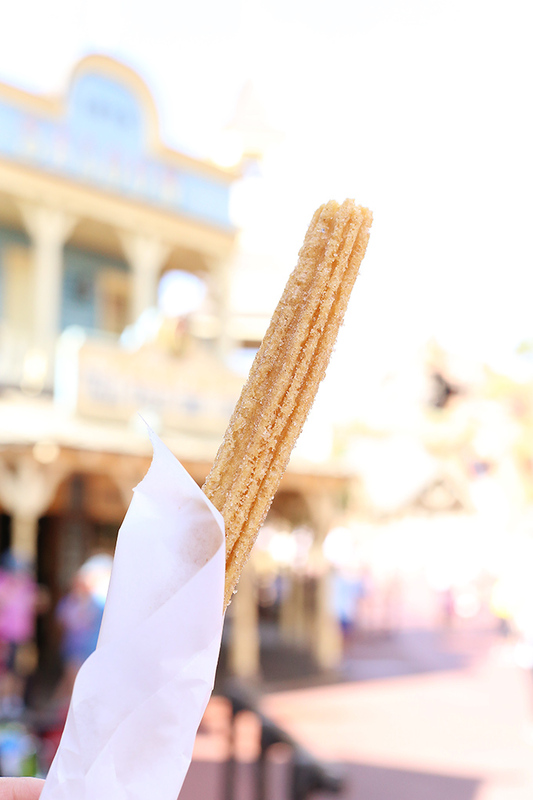 It’s basically an unspoken rule that you can’t leave Disney without at least taking a bite out of a churro. Head to the Frontierland Churro Cart for these yummy treats and don’t forget your side of chocolate sauce. You might just catch the Country Bear Jamboree characters out and about in this area. 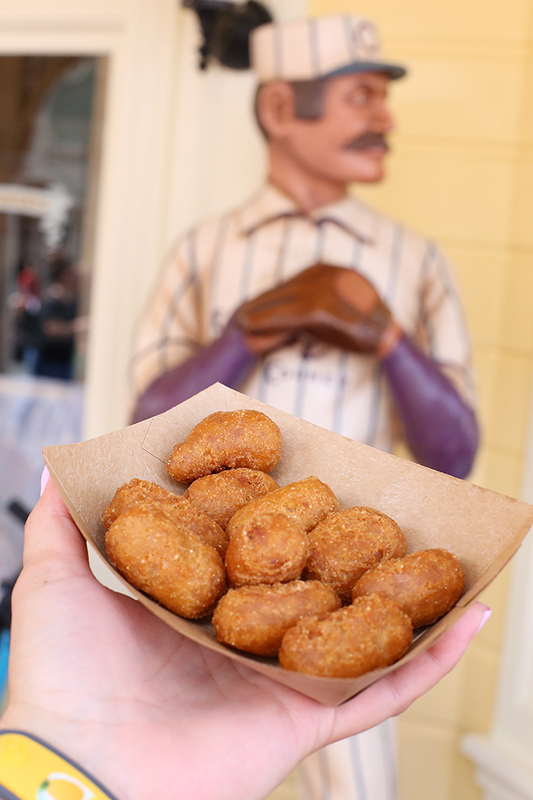 I’m not even a corn dog fan, but these Disney corn dog nuggets are a must eat snack for me! You can find them at Casey’s Corner on Main Street, U.S.A. I recommend placing a mobile pick up order because this place is popular. If you are lucky enough to snag a reservation at Be Our Guest in Fantasyland, you won’t want to miss the grey stuff. 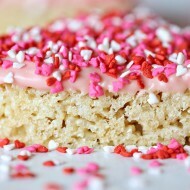 Like the song goes, it really is delicious! If you are there for dinner, I highly recommend the braised beef. LeFou’s Brew is a non-alcoholic frozen apple drink with a hint of toasted marshmallow that can be found at Gaston’s Tavern. The flavor combo sounds a little odd, but it totally works! If it’s not too hot, grab a seat by the fountain just outside Gaston’s Tavern. I’m not sure how Disney does it, but their popcorn is the BEST! 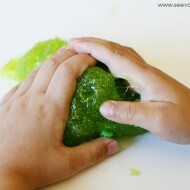 Way better than movie popcorn. 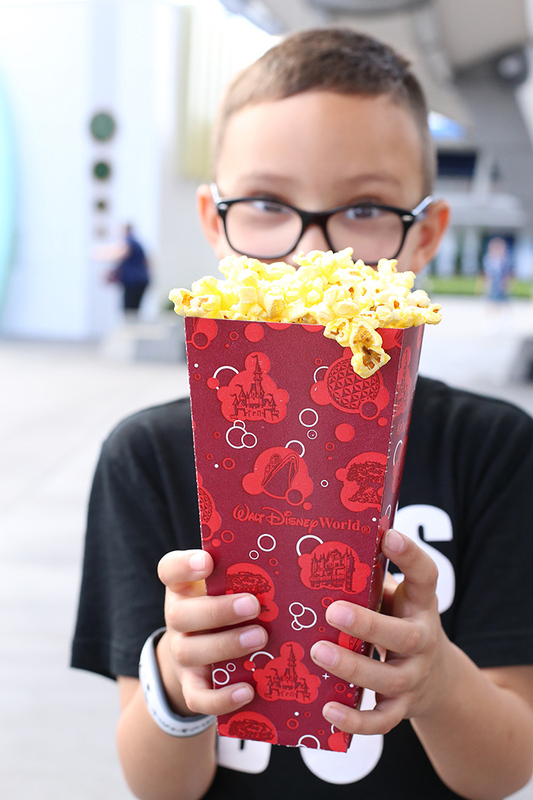 If your family loves popcorn, you can purchase a Souvenir Popcorn Bucket with discounted refillable option. Popcorn carts are all over Magic Kingdom, but we always seem to frequent the one in Tomorrowland (which almost never has a long line). Nothing says “I’m in Disney World” quite like gnawing on a giant hunk of meat. The Disney turkey leg just screams nostalgia for me. 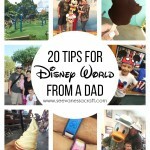 I remember two very distinct things from my first childhood Disney trip – the Tomorrowland Speedway and Turkey Legs. 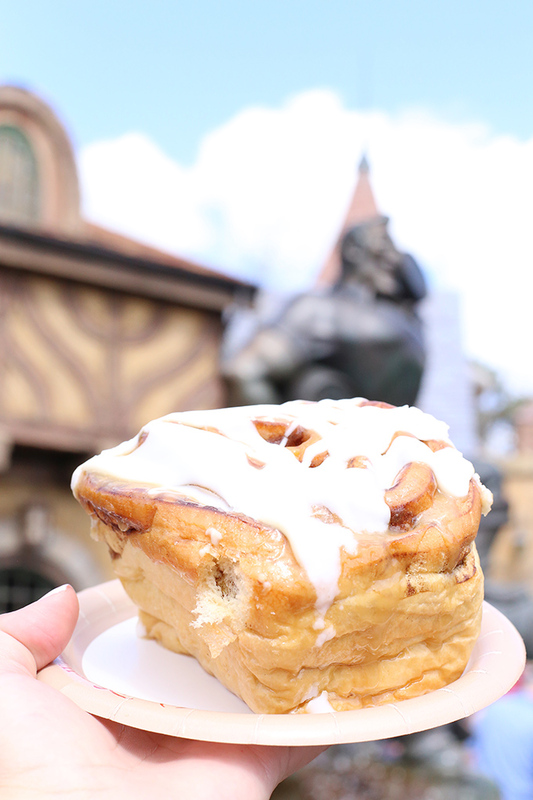 Also found at Gaston’s Tavern, the cinnamon rolls are amazing and large enough to share. This is one of my favorite areas in Magic Kingdom to enjoy a snack and people watch from. 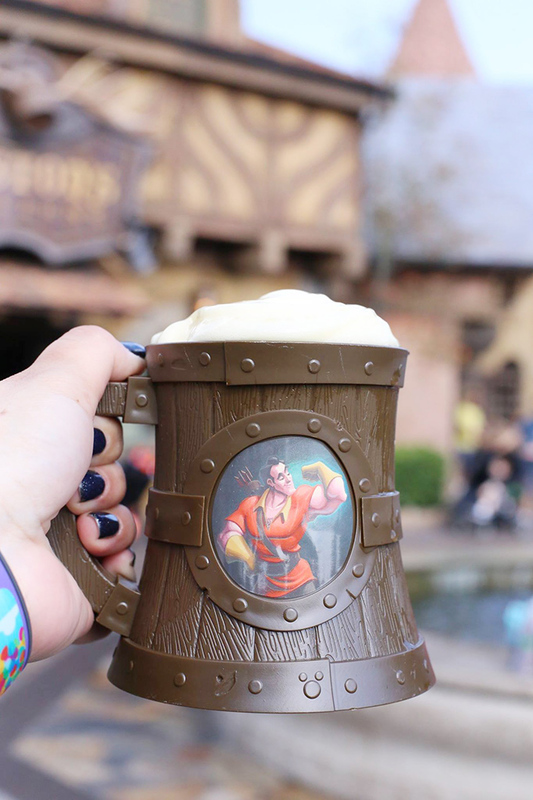 Gaston himself also makes regular appearances near his tavern, so be on the lookout for him!